Just two weeks out from a classic Grey Cup matchup between the Toronto Argonauts and the Calgary Stampeders, Toronto will be looking to bring another pair of Canadian championships back home. In the main event, Toronto favorite Kane Heron, looks to capture the WBA-NABA welterweight title on home soil. After battling injuries early in his career, Heron has been one of the most active Canadian fighters over the past year and a half, scoring five wins in 2017 alone. “Kane has worked tremendously hard this year—maybe harder than any other fighter in the country. He’s in the best shape of his career, the best mental state as well, and he’s ready to cap off the year in the best way possible,” said Baxter. Heron will battled Quebec’s Dwayne Durel, whose lone loss came in controversial fashion at the hands of the tough Jose Guillermo Garcia. If not for the split decision going the other way, Durel would have an unblemished professional record to go along with his exceptional amateur career. “This might as well be a battle of undefeated fighters. But more importantly, it’s Toronto vs. Montreal. Ontario vs. Quebec. There’s maybe no better rivalry in all of sports, or Canadian boxing, as fans in our country know,” said Baxter. In the co-feature, Patrice Volny defends his WBA-NABA Canadian Middleweight title against the hard-hitting Janks Trotter. Volny has established himself as one of the best fighters in Canada, and one of the top prospects in the middleweight division on the world stage as well. Since signing with Baxter and making his fighting home in Toronto, the Quebec native has scored four consecutive knockouts and rocketed to the top of the Canadian rankings. In Trotter, he’ll encounter the toughest test of his career, one of the country’s most feared knockout punchers. The rugged Calgary native has fought on some of the biggest stages in boxing, including the Bell Centre in Montreal, and the MGM Grand in Las Vegas. 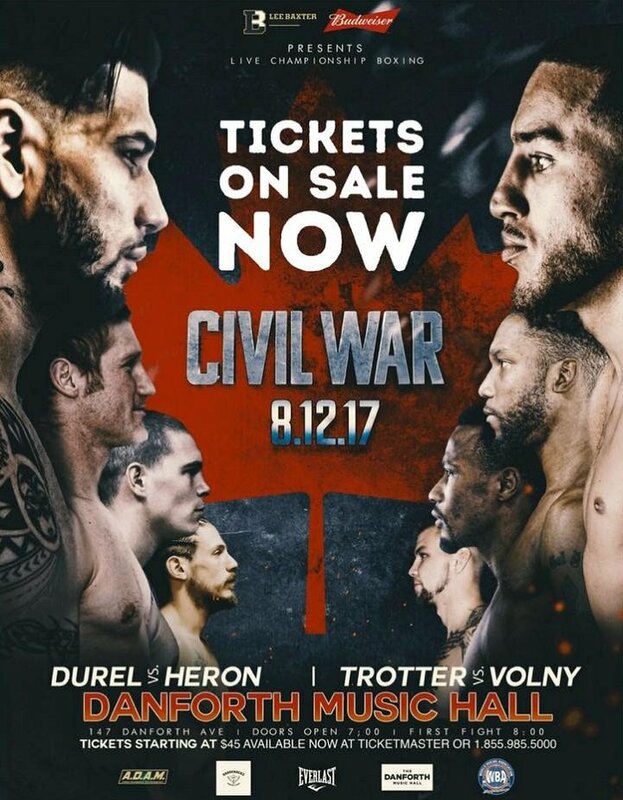 Trotter has scored highlight reel knockouts over top Canadian prospects such as Phil Rose and Richard Reittie, and will look to do the very same to Volny in downtown Toronto. Additionally, in a special attraction, one of Canada’s top amateurs of this most recent era, Mazlum Akdeniz will make his Ontario debut. Akdeniz came to Canada at the age of five, and eventually found his way to a Montreal boxing gym as a 16-year old, looking to become like the world champions he saw on HBO and Showtime. It wouldn’t be long before he had amateur titles of his own, capturing the 2015 Ringside championships in the United States. But it was in his final bout as an amateur that the boxing world realized how special he was. Akdeniz defeated Jorge Moiran Vinent, becoming the first Quebec-based boxer to defeat a Cuban fighter since the legendary Jean Pascal in 2005. After starting his professional career with two knockouts in Quebec, the 20-year old has relocated to Toronto, where he is now signed with Lee Baxter Promotions. Akdeniz has goals beyond the sport of boxing though, despite the fact that many project him to be a future world champion. Mainly, he wants to be a role model and a uniting force for the Kurdish community in Toronto, and in Canada at large. “Kurdish people are not the richest or the biggest group of people but if we get a few names to become famous we can put ourselves on the map,” said Akdeniz, who donates proceeds from his fight purses to churches in Turkey, as well as anti-terrorism efforts. Tickets are on sale now through Ticketmaster, and start at just $40. Previous boxing news: Tyrone McCullagh vs. Tom Tran this Fri.